A rare white stork has become an unexpected celebrity this Christmas in Central Finland. The large bird decided to stay in Finland for the winter, instead of migrating to warmer climes. Now the country’s birdwatchers are scrambling to provide the long-legged rarity with three kilos of meat and fish a day, and his host family is trying to figure out a way to coax ‘Joppe’ to use the barn for shelter before the weather gets colder. White storks have not traditionally bred as far north as Finland and sightings are very rare. 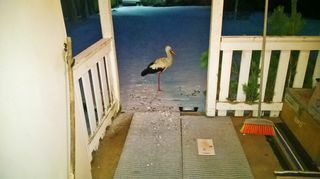 Nevertheless the first white stork couple known to have made a permanent nest in Finland was recorded just last August, in the southwest city of Koski, near Turku. 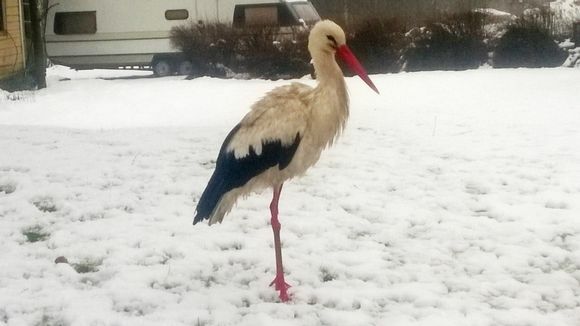 To the delight of Finland’s abundant birdwatchers, a lone white stork has chosen to take up residence in the city of Pihtipudas this winter, located in the heart of the country. The winter visitor, whom the locals have given the name ‘Joppe’, lives at the Hytönen family’s farm. Pentti Hytönen says Joppe most likely ending up staying in Finland by mistake. “He probably arrived in this area this autumn with a flock of swans. My neighbour was digging a trench with his excavator and the stork hung around to watch because the work made a lot of good food like voles available,” he says. Ever since the ground froze over, the Hytönen family and their neighbours have combined their forces to keep Joppe fed. “We realised that his food was limited, so we began to feed him. Now he has taken a liking to our farmhouse yard. So far, he’s been eating herring, vendance, minced meat and last year’s elk meat from the freezer. He doesn’t care for sausage and bread, but we’re not supposed to give him anything with salt anyway,” Hytönen says. Joppe has become so comfortable among his hosts that he already lets them come within a few meter’s radius. “I talk to him and he tilts his head back at me. I’m trying to build up his confidence in me so I can tempt him into our empty barn when the weather gets cold. It stays a good 10 degrees Celsius in there, so it would be just right for him. We wouldn’t close him in there; he could still move around freely,” says Hytönen. Hytönen says he thinks the stork will get by outside too, if the weather doesn’t get much colder than minus 10 degrees and the river near the house doesn’t freeze. He says Joppe has a great appetite. “He eats three kilos of meat and fish a day. He comes begging for his breakfast under the kitchen window in the morning, and you can count on him being back in the evening to pick up his food,” he says. Birdwatchers throughout Finland have mobilised to help the Hytönen family with feeding the rare visitor, taking up a collection to assist the family with the costs.